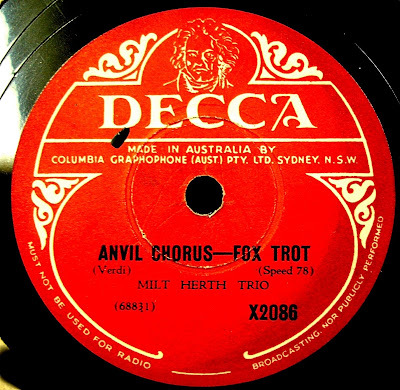 Yep its that funky sound from milt and his trio..
Milt Hearth - Anvil Chorus MP3 "Good"
Milt Hearth - Anvil Chorus MP3 "Too Much Noise Reduction"
Milt Hearth - Anvil Chorus MP3 "Fake Stereo"
Oy Mate! Truly exceptional audio cleaning! I am also an admirer of Milt Herth with or without his trio. Should you happen across any other of his "works", I'd be most grateful if you would post them. I believe his Hammond styling was far ahead of it's time. Yeah Ive only recently been "turned on" by the unique talent of Mr Hearth. Wow i diddnt know Milt Played solo! Would like to hear that..
Did you hear "huckelberry duck"? its the track that opened my ears so to speak! Move only Hrs away. when I get "Set Up" ill restore some more.. Keep reminding me!